Nurses may soon have to learn a new set of practice guidelines when it comes to all their patients. The Endocrine Society has issued new clinical practice guidelines concerning inpatient monitoring of blood glucose levels. Whether or not patients have been diagnosed as diabetics, patients admitted to a facility should receive blood glucose monitoring as long as they are not receiving intensive nursing care. The January 2012 issues of Journal of Clinical Endocrinology & Metabolism published the new standards. Citing observational studies which found that hyperglycemia affects 32 to 38 percent of inpatients in community hospitals regardless of a pre-existing diagnosis of diabetes, the eight-person task force – all experts in the field of endocrinology – developed new evidence-based guidelines and designed protocols, system improvements and glycemic targets in order to facilitate better blood glycemic control. Dr. Guillermo Umpierrez of Emory University, the task force chair, stated that long hospital stays, higher infection rates and death in non-critical patients were all linked to hyperglycemia. – Blood glucose testing upon admission for all patients admitted to the hospital whether they are a known diabetic or not. Diabetic patients will automatically receive A1c level testing if none has been done in the last two to three months. – For the majority of hospitalized patients, the target premeal glucose level should not exceed 140 mg/dl; random testing should not reveal more than a 180 mg/dl level. If glucose levels fall under 100 mg/dl or 70 mg/dl, treatment should be reevaluated or modified. – Closer monitoring should be implemented for patients not at risk for hypoglycemia, and for terminally ill or end-of-life patients and patients who are more likely to develop hypoglycemia. – Diabetics on injectable insulin should continue to receive insulin as long as they are inpatients. – As a preventive measure to perioperative complications, all type 1 diabetics and the majority of type 2 diabetics should receive a continuous IV insulin infusion or “sub-q” insulin with bolus insulin used as needed. 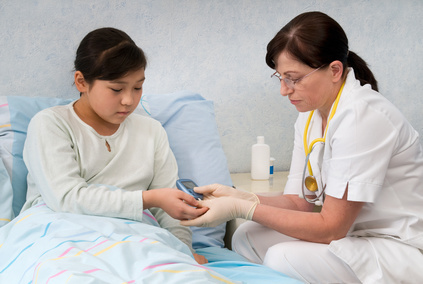 – Patients admitted with a higher than 140 mg/dl glucose level and patients receiving enteral or parenteral nutrition should be monitored with bedside glucose testing, whether the patient is diabetic or not. Patients on corticosteroids or octreotide should also receive bedside glucose testing. – One to two hours after completion of continuous IV insulin, patients should be transitioned to “sub-q” insulin. The new guidelines were reviewed by Endocrine Society members, the American Diabetes Association, the American Heart Association, the American Association of Diabetes Educators, the European Society of Endocrinology and the Society of Hospital Medicine. While the new guidelines will likely increase the workload of nurses, better guidelines may decrease the risk of infection and save patients’ lives.